Eurozone PMI In Steepest Decline Since 2009! With the markets giddy over the ‘success’ of people spending more money than they can afford on gifts that make little practical sense, other inquiring minds note the Markit Flash Eurozone PMI® shows Eurozone sees ongoing steep decline as services suffers worst month since mid-2009. 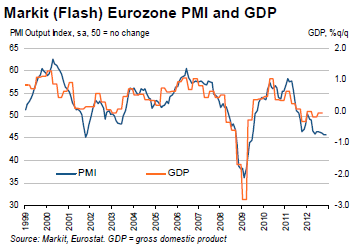 Flash Eurozone PMI Composite Output Index at 45.8 (45.7 in October). Two-month high. Flash Eurozone Services PMI Activity Index at 45.7 (46.0 in October). 40-month low. Flash Eurozone Manufacturing PMI at 46.2 (45.4 in October). Eight-month high. Flash Eurozone Manufacturing PMI Output Index at 45.9 (45.0 in October). Two-month high. Activity has now fallen in 14 of the last 15 months, with the exception being a marginal increase seen in January. Output fell sharply in both the manufacturing and service sectors and, while the former saw the rate of contraction ease slightly, the latter saw business activity fall at a rate not seen since July 2009.
rate of decline in the services sector was partly offset by manufacturers reporting that their rate of loss of new orders had eased slightly to the weakest for eight months. The plight of the service sector was also highlighted by companies’ expectations for activity in the year ahead dropping to the lowest since March 2009. Sentiment dropped especially sharply in Germany, but improved slightly in France. near-three year record seen in October. The Markit Flash Germany PMI® shows Sharpest fall in services activity for almost three-and-a-half years, but manufacturing downturn eases in November. Flash Germany Composite Output Index(1) at 47.9 (47.7 in October), 2-month high. Flash Germany Services Activity Index(2) at 48.0 (48.4 in October), 41-month low. Flash Germany Manufacturing PMI(3) at 46.8 (46.0 in October), 2-month high. Flash Germany Manufacturing Output Index(4) at 47.7 (46.3 in October), 2-month high. November data indicated that the combined output of the German private sector dropped at a broadly similar pace to that seen in the previous month. However, this masked divergent trends in the performance of the manufacturing and service sectors, with the former posting a slower drop in output compared with October while the latter registered its fastest contraction since June 2009. Another overall reduction in German private sector output reflected an ongoing contraction in new business volumes. Lower levels of new work have now been recorded in 15 of the past 16 months. Manufacturers and service providers indicated broadly similar rates of decline but, as with output, there was a divergence in momentum compared with that seen in October. Service providers posted the steepest decline in new business for three months, while the drop at manufacturers was the slowest since March. The latest drop in new export orders received by manufacturers was the least marked for six months, which some firms linked to support from stronger demand in China. Shrinking new business volumes in the service sector contributed to a steep drop in expectations for activity over the next 12 months. The index measuring service providers’ business expectations was the lowest since March 2009. German private sector employment dropped at the sharpest pace since January 2010. A softer fall in manufacturing staffing levels was offset by the most marked decrease in services jobs for three-and-a-half years. Meanwhile, backlogs of work in the German private sector dipped for the seventeenth successive month in November, suggesting an ongoing lack of pressure on operating capacity.